simmer gently for 1 minute more.Remove from the heat and set aside, leaving the lemon slices in the syrup. Preheat the oven to 160°C/325°F/gas mark 3. Grease and line a 20cm x 20cm square baking tin. 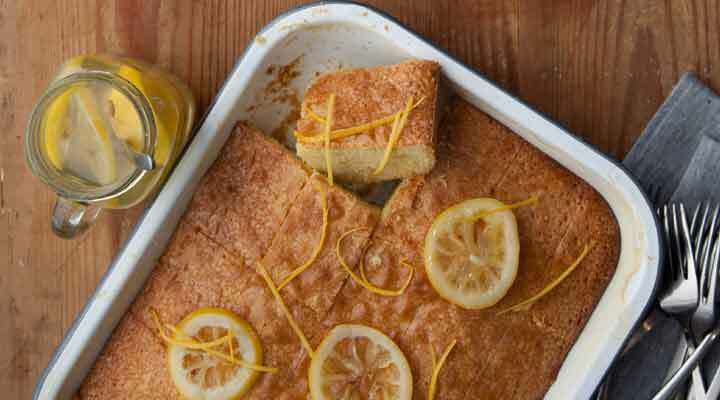 To make the cake, place the butter, sugar and lemon zest in a mixing bowl and beat until light and fluffy. mix until just combined. Pour the batter into the prepared baking tin. some syrup over the cake while it’s still warm and scatter over some slices of candied lemon. with the icing sugar in a small bowl until smooth and well combined. If the drizzle is too thick, add a drop or two of hot water and beat into the icing until it’s a runny consistency. Drizzle the icing over the top of the cake. Cut into squares to serve.